Insects and engineering; these may seem like rather strange bedfellows, but in reality, nothing could be further from the truth! Insects are capable of achieving an array of acrobatic feats that would leave most Olympians in awe and it’s this that has got engineers so excited! According to a recent article from the BBC, for years scientists and engineers at the universities of Bristol and Cambridge have been working with an array of insects, including fleas, locusts and even praying mantises, in order to discover exactly how these insects take to the air. And what they have found is really rather extraordinary! Thanks to their unique biology, insects have been able to overcome a wide range of problems, in order to increase their chances of survival. The humble flee might not look like much. But these intriguing insects are actually equipped with an array of super-powers. For example, fleas typically rely on their ability to jump to escape danger. But in order to do so they have to accelerate in a very short space of time. Hence it’s rather lucky for them that they have the ability to release the energy in their legs in one thousandth of a second! Pretty neat right ?! 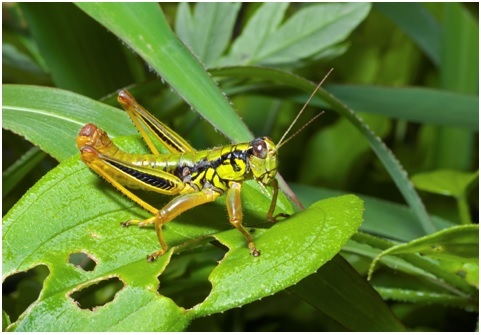 It’s not only fleas that are equipped with this remarkable energy releasing ability either, other jumping insects, such as grasshopper and locusts are also able to release energy from the muscles in their legs surprisingly quickly. If you’re wondering what makes this possible, it’s all thanks to a little clever design and engineering on the part of mother nature. The best way to visualise how this system works is to picture a bow and arrow. If you draw an arrow the energy to perform this action comes from your muscles, however it’s actually storied in the bow. The bow is then able to amplify the speed at which this energy is released, propelling the arrow forwards with greater speed. Similar springs – akin to an internal bow- can be the found in the legs of fleas and other jumping insects – and these can be used to store energy, enabling the insects to take off at a moment’s notice and escape their foes. Following a number of years of investigation scientists have uncovered examples of innovative biological springs inside the legs of insects. These are made of insect cuticle – the material that compromises the exoskeleton of an insect- and a type of protein known as resilin – these materials are layered giving the springs properties akin to those found in bows. All this goes to show that sometimes engineering marvels can be found in even the most unexpected of places! Here at European Springs, as leading die spring manufacturers, we know a thing or two about what it takes to make a good spring! And can supply a wide range of high quality springs that would put even those designed by nature to shame. For more information about our products and services, please don’t hesitate to contact our friendly team today, by giving us a call on +44 (0) 208 663 1800.